In January I’m taking up a new role as head of social design at the Young Foundation. I will remain an associate fellow of Said Business School at the University of Oxford where I have been teaching an MBA elective on design and design management since 2005. I am excited about the opportunity to join the Young Foundation and contribute to its work on social entrepreneurship and innovation. Especially at a time when the existing ways of doing things are failing or are under severe stress from climate change, funding cuts in the public sector, and increasing inequalities between resource owners and others who could use them. Here are some of the reasons I’m taking this role. Working in the spaces between research and action. Having been inside academia for some years I’m not sure that universities are a good place to do social or organizational research that leads to effective change. But “do tanks” like the Young Foundation potentially are. For every example of excellent scholarship that is engaged with public matters and communities outside academia (“Mode 2” knowledge), there are many others that produce research that is made use of by only other academics. I love reading a brilliant paper but brilliant papers are usually not digestible by non-academics. Many papers sitting in academic databases are hardly read by other researchers, let alone engaged with by people working in organizations or communities. So working with the Young Foundation and its network of ventures and partners will provide an opportunity to create faster feedback loops between research and action, at a time when there is a significant need to understand what is going on, try out new ways of doing things, and learn what the effects are. Working collaboratively across different kinds of expertise. The institutional incentives in academia are not geared to rewarding and supporting interdisciplinarity. The UK Research Councils have been trying to change this. For example they host “sandpits” where researchers from different fields, who have often not met before, and have quite different research cultures and agendas, construct project outlines during a residential workshop, that they then may work on together. But unless you are a senior, tenured academic, your institution generally rewards you for publishing in discipline-specific peer-reviewed journals, not for taking part in messy, cross-disciplinary projects that may or may not contribute to the various fields involved. And it is often hard for small organizations like SMEs, or the shifting practices and people that constitute local communities, to get involved in such research. Organisations like the Young Foundation which have research expertise and strong links with communities, businesses and policymakers, have the potential to be involved in and set up multi-expertise collaborations that generate learning and outcomes, without being overly shaped by discipline-specific practices and rewards. Developing a culture of strategic design and collective experimentation. The Young Foundation’s activities include creating new ventures, prototypes, research, advisory work and consultancy. In establishing this new role, the Foundation wants to build on its experience of working with service designers, and learning from members of its team not trained in design using approaches from design practice in their work. At a time when people in different contexts are turning to design, and designers are finding new sites for their work, including in public services, communities and sustainable living (eg MindLab in Denmark, Participle in the UK, The Australian Centre for Social Innovation, Project H in the US, and the DESIS Network), I am pleased to have an opportunity to help the Young Foundation develop its own vision of what social design might be. Just as the term “social” immediately generates questions – is it the social of social media, or of social innovation, or of social theory? – so, too, “design” is very hard to pin down. The way I think about this is to combine the practices of the art or design studio with creative, collective research and experimentation in the field: what I call the fieldstudio. Having explored some of these ideas in my consultancy, in academia, my arts practice, and most recently at consultancy Taylor Haig, the Young Foundation seems an appropriate context to try and contribute to explorations of design in the expanded field. One activity I’ll be working on is a new venture called the Global Innovation Academy. Supported by the Rockefeller Foundation, NESTA, the Gulbenkian Foundation and others, this aims to create a learning platform, tools and an experience for people in different kinds of organization who want to work in response to contemporary global challenges. Potentially this initiative is a disruptive intervention into professional higher education, currently being challenged because of high student fees and to what extent students are prepared for a complex world. My work will focus on the curriculum and learning experience. I will bring to this some of what I have learned by teaching a design elective in a business school for six years, and collaboration and dialogues with other educators such as Parsons The New School for Design (with programmes such as the MFA Transdisciplinary Design), UC Falmouth (setting up a Creative MBA), London College of Communication (with its MDes Service Innovation), and Duncan of Jordanstone College of Art and Design, Dundee (with its MSc Design Ethnography and MDes for Service). Although it’s 60 people, the Young Foundation feels like it has a start-up culture. It builds on the legacy of Michael Young, who created what are now well-established institutions such as the Open University, and was under Geoff Mulgan’s leadership until his recent move to NESTA. To date, it has been involved in creating or supporting over fifty ventures and initiatives from neighbourhood websites to community schools, new models of healthcare to training community campaigners. But it’s an organisation that is still creating itself, now under the leadership of Simon Tucker. With a matrix structure and several women in senior positions, it seems to have the flexibility and openness that I value in an employer. How to lead and facilitate the Young Foundation’s move to develop design capabilities, not so much by hiring designers, but increasing the whole organisation’s design literacy, understanding, knowledge and skills to develop a more designerly culture; and finding ways to understand its effects and impact and articulate a perspective on design in the expanded field. How to use design to set up and enable creative collisions between the worldviews and practices of policymakers, community members, activists, researchers from interpretive social science, designers and artists, managers and technologists, to produce radical reconfigurations of resources to grapple with the challenges facing local and global communities. We’ll be starting a blog in the Young Foundation’s new social design practice area, so this personal research blog will become quieter. I look forward to continuing and deepening many existing dialogues to explore the potential for this work in the UK and internationally. I resigned from YF a few months after joining and left in October 2012. 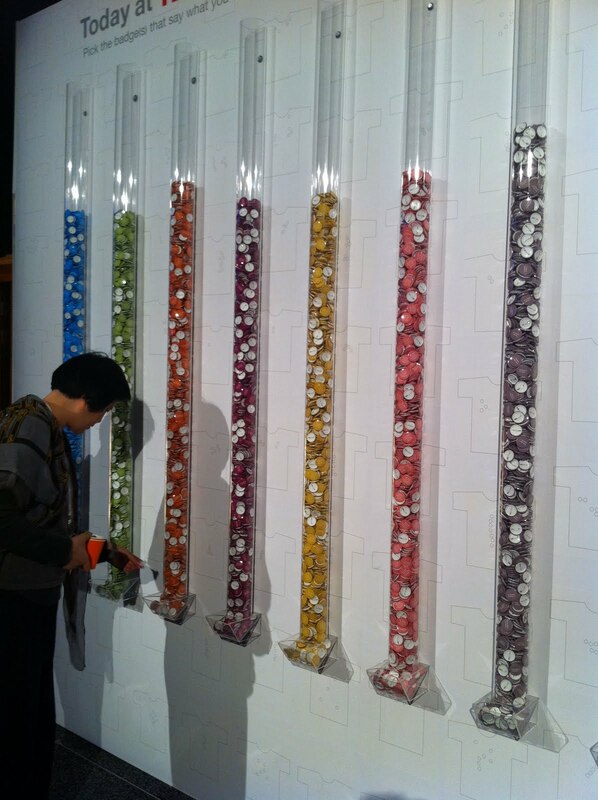 My Physical Bar Charts installation is currently at the Palazzo Strozzi in Florence, part of the group exhibition Declining Democracy at the Centro di Cultura Contemporanea, open until January 2012. This is thoughtful exhibition exploring different means by which publics give voice or shape to their concerns. Other pieces include Francis Alys' When Faith Moves Mountains, a video which documents a process in which the artist involved around 500 volunteers in moving a large sand-dune close to a slum in Peru in 2002. 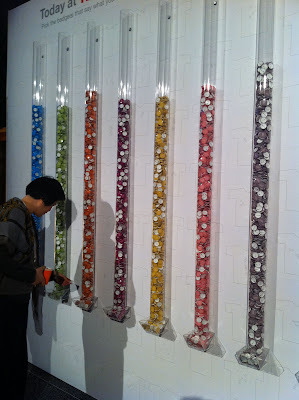 This shocking piece asks the visitor to consider how "social" purposes take shape and are acted on. The apparently pointless act of moving of the sand-dune reveals how people are captured and engaged by ideas and then contribute to making things happen. Roger Cremers' photographs show different people are involved in a hobby of re-enacting aspects of World War 2. Michael Bielicky & Kamila B. Richter created a digital installation called Garden of Error and Decay in which data from Twitter and stock markets leads to a changing animated landscape. In some ways Declining Democracy picks up and develops themes from the 2005 show Making Things Public at ZKM Karlsruhe, but where that was a monster exhibition involving many academics as well as artists, designers and others, this is a smaller, tighter exhibit which carefully constructs a way of thinking about how people make present their questions, criticisms and concerns about the world we live in - how we engage and to what effect. Declining Democracy also subtly interacts with the exhibition upstairs at the Palazzo Strozzi. Entitled Money and Beauty: Bankers, Boticelli and the Bonfire of the Vanities, it uses a mixture of paintings, historic artefacts and documents to trace connections between the development of international finance in Renaissance Florence and the emerging mercantile class and signifiers of wealth such as paintings. See the review by Jonathan Jones in The Guardian. All relevant to today in the current economic, financial and cultural crisis. 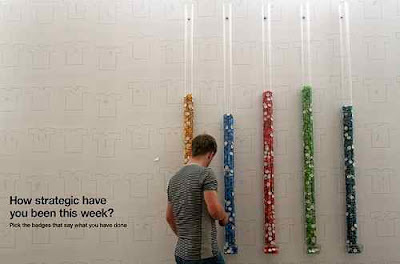 For this version of the Physical Bar Charts, the question posed next to the installation is "What did you do last week that made you a citizen?" in Italian and English. 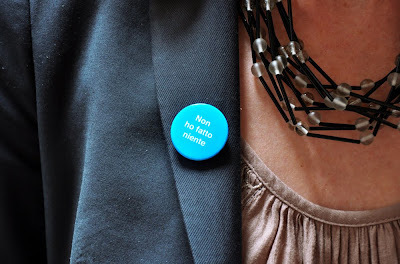 Badges in English and Italian in eight tubes offer ways to answer this question. People can take as many badges as they want. I obeyed the law (least popular). The Physical Bar Charts do not purport to constitute "real" research that is statistically valid or reliable. But somehow the piece tells us something about a predominantly Italian audience at a time when Italy's democratic institutions are being questioned. 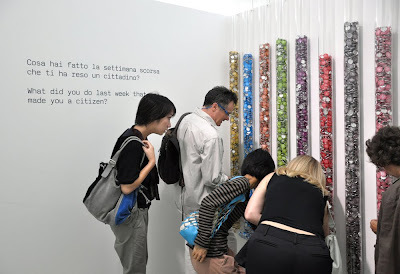 The aesthetic qualities of the tubes and badges draw people in, adding a qualitative dimension to the typically dull routine of filling in a questionnaire or other data-gathering interfaces. But they do more than this too, since when people start wearing the badges, this triggers new connections and engagement. A Dutch journalist at the opening told me he had selected, worn and then taken off the badge saying "I broke the law" because he didn't want people to start asking him the circumstances. As a device the bar charts represent a low-tech way for people to reflect on their own participation in public questions and see how others do too. They make us public and potentially accountable too. Why do people use cars for short journeys when there are more sustainable alternatives? Behave: New services to change travel behaviours from Lucy Kimbell on Vimeo. This short film proposes new service concepts to change the travel behaviours of car owners for short journeys. The ideas were created in a two-day workshop held in Oxford in 2011, by mixed teams of MBAs, MDes and MSc students. Focussed on the Oxfordshire town of Bicester, the project is based in the idea that 'travel behaviours' cannot be separated from other social practices. The film suggests that shifting towards new travel behaviours involves creating new combinations of meanings and stories, infrastructure and stuff, skills and competences, and emotions. This collaborative project involved 55 students including MBAs taking my elective in Designing Better Futures at Said Business School, University of Oxford; students on the MDes Innovation and Creativity in Industry at London College of Communication at University of the Arts, London, and students on the MSc Environment Change and Management at the University of Oxford. Collaborators included travel planners from Oxfordshire County Council. The film and workshop were financially supported by Samsung Design Europe. My Physical Bar Charts will be part of the group exhibition Declining Democracy at the Centre for Contemporary Culture Strozzina in Florence. Contemporary art as a platform to explore contemporary social and political issues: the exhibition presents the diverse artworks of twelve international contemporary artists that create a reflection on the values and contradictions that typify today’s society, addressing the possible declinations of the principles of democracy, which is being challenged more and more today. The exhibition was born out of a consideration of the contemporary international situation. While the current economic crisis has triggered deep social unrest in Western countries, a new sense of revolutionary political utopia, different from, yet parallel to developments in Europe, appears to have gained a foothold in the countries of North Africa and the Middle East. The artworks on display will consider such themes as the clash between the individual and the community, the growing gap between the average citizen and the political classes, the power and influence of economic lobbies and mass media, the issues surrounding immigration and new potential forms of democratic participation. Declining Democracy is a project devised by CCC Strozzina with the scholarly contribution of Piroschka Dossi, Christiane Feser, Gerald Nestler and Franziska Nori. Here are some of my recent publications in peer-reviewed journals. Some of them have been years in the making, a combination of major life changes (having a child, serious illness, moving house three times, family illness, being made redundant, etc, etc) and some are to do with the slow pace of peer review. But another important factor is that sometimes it takes time to get the ideas right - working out what you are trying to say and to whom. In contrast to the world of twitter and blogging, the slower speed of academic writing, reading, reviewing and dialogue can - if things go well - produce rich, more thought-through contributions. Or at least this has been what I have been telling myself as I revise and revise again. And then of course there is the pressure to perform as a researcher by creating public, traceable outputs that locate yourself in relation to other academic productions. Ironically now that I am no longer an academic (in the sense of having a faculty post), here, at last, is some product. Only one of these papers are easily available through an open access journal; the others are in journals that require subscription, which means they are therefore inaccessible unless you have university library access. Please contact me directly if you would like a digital copy of my original text. Kimbell, L. (2011) Rethinking Design Thinking: Part 1, Design and Culture, 3(3): 285-306. (Accessing this journal requires a subscription). ABSTRACT	The term design thinking has gained attention over the past decade in a wide range of contexts beyond the traditional preoccupations of designers. The main idea is that the ways professional designers problem-solve is of value to firms trying to innovate and to societies trying to make change happen. This paper reviews the origins of the term design thinking in research about designers and its adoption by management educators and consultancies within a dynamic, global mediatized economy. Three main accounts are identified: design thinking as a cognitive style, as a general theory of design, and as a resource for organizations. The paper argues there are several issues that undermine the claims made for design thinking. The first is how many of these accounts rely on a dualism between thinking and knowing, and acting in the world. Second, a generalized design thinking ignores the diversity of designers’ practices and institutions which are historically situated. The third is how design thinking rests on theories of design that privilege the designer as the main agent in designing. Instead the paper proposes that attending to the situated, embodied routines of designers and others offers a useful way to rethink design thinking. 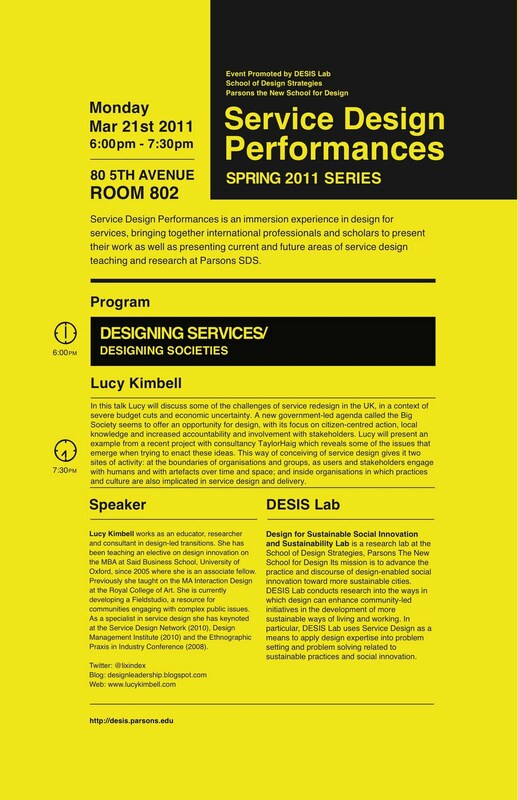 Kimbell, L. (2011) Designing for Service as One Way of Designing Services, International Journal of Design, 5(2): 41-52. ABSTRACT This paper considers different ways of approaching service design, exploring what professional designers who say they design services are doing. First it reviews literature in the design and management fields, including marketing and operations. The paper proposes a framework that clarifies key tensions shaping the understanding of service design. It then presents an ethnographic study of three firms of professional service designers and details their work in three case studies. The paper reports four findings. The designers approached services as entities that are both social and material. The designers in the study saw service as relational and temporal and thought of value as created in practice. They approached designing a service through a constructivist enquiry in which they sought to understand the experiences of stakeholders and they tried to involve managers in this activity. The paper proposes describing designing for service as a particular kind of service design. Designing for service is seen as an exploratory process that aims to create new kinds of value relation between diverse actors within a socio-material configuration. This has implications for existing ways of understanding design and for research, practice and teaching. 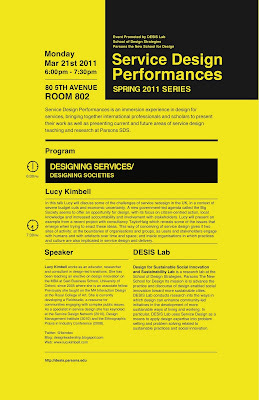 KEYWORDS: Designing for Service, Service Design, Service Management. Kimbell, L. (2011) An Aesthetic Inquiry into Organizing Some Rats and Some People, Tamara: Journal for Critical Organizational Inquiry, 9(3-4): 77-92. ABSTRACT Rats crawling, an art gallery, rats as art, warm furry bodies, bright plastic tubes, disgusting, chilled dead frogs, rats for science, a preparation, a sweet little rat, a village hall, women in white coats, rats in cages, a rosette, urine, a rat in a pouch, cuddles, rats for art, the winner is, strong black tea, how many do you have, in the literature, breeding, get more rats, a rat down a sleeve, I’’ll give you a lift, sign in, a rack of cages, what is that, the data shows, please wash your hands, they can smell your perfume, protestors, I don’’t know, a knock out, brain surgery, squeak squeak, the Morris water maze, toys, slice, you are a messy boy, the critique, I haven’’t got a licence, drawings, rats in art, do you mind, a duvet, insurance, a queue, a drawing device, sugar rats, chunky knits, where’’s the nearest rat, black rubbery tails, video camera, a T-maze, sawdust, a cleavage, nail clippings, face painting, artist rat, drawings, it’’s different, two young women, a judge, art for rats, agility training, he remembers from last time. Today at TED Global...by Lucy Kimbell. Video timelapse edited by Kiersten Nash; timelapse data grabbed with help from Mike Femia of TED. 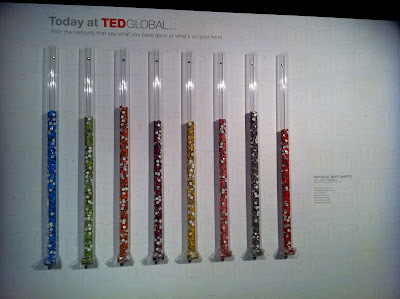 My Physical Bar Charts were installed at TEDGlobal 2011 in Edinburgh in July. Over the conference, people helped themselves to badges from the installation, which together revealed a picture of what this temporary community was thinking about and how the conference shaped their activity. People are invited to help themselves to badge(s) that say something about what's on their mind or what they have been doing at TED. 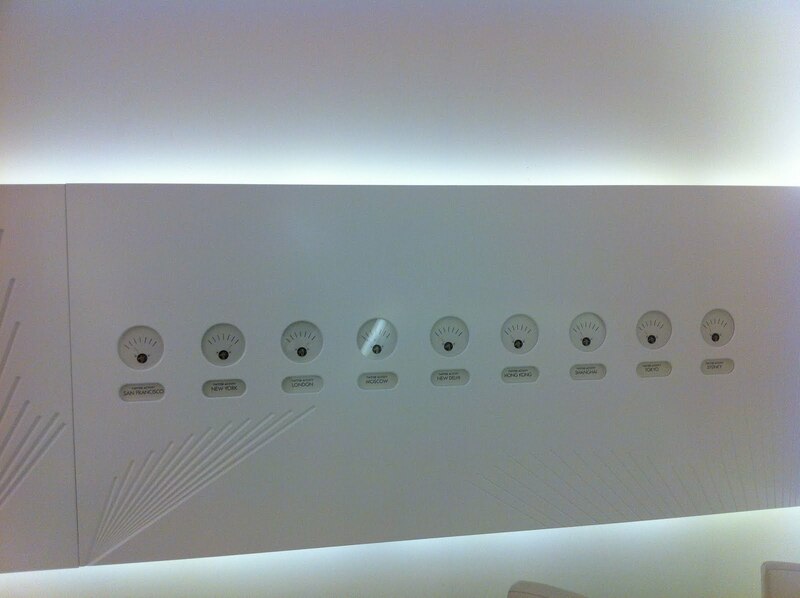 Most of the badges are deliberately in the first person and refer to acts in the past. They of course mean different things to different people, but once selected and then worn, can spark conversations among members of the conference community. At the same time, the Physical Bar Charts reveal a collective picture - what the community says it has been doing as a whole. Together, as a device the Physical Bar Charts are an example of social data gathering, collaborative sense-making, playful research, real-time reporting, experiential inquiry. They spark conversations and prompt a community such as TED to reflect on its concerns and practices. This is the eighth time the piece has been shown. It was first developed and shown, in collaboration with sociologist Andrew Barry, for the group exhibition Making Things Public, curated by Bruno Latour and Peter Weibel at ZKM Karlsruhe, Germany, in 2005. (See the catalogue published by MIT Press.) In other versions, the piece has explored how people think about citizenship and political activity and to what extent they want to make public their participation in collective life. The bar charts have been installed in venues such as public libraries, a university campus, art institutions and also small galleries on a city high street. The next version of the piece will be one created for the specific context of contemporary Italian politics, in a group show on democracy at the Palazzo Strozzi, Florence, opening in September 2011. 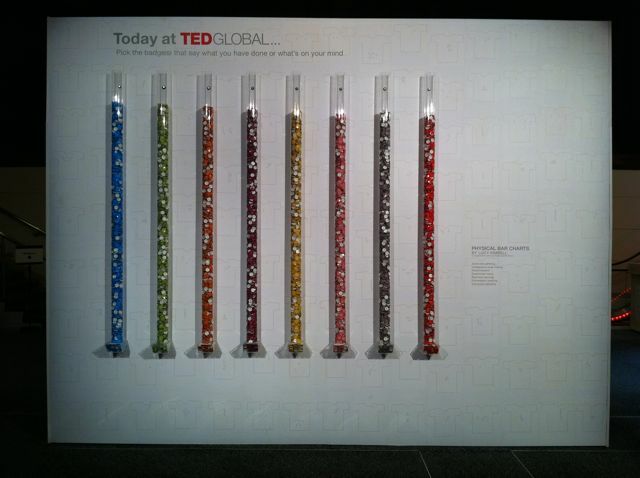 My participative installation Physical Bar Charts will be installed at TEDGlobal 2011 in Edinburgh for the duration of the four-day conference in July. This is the eighth time I have made the piece, which was initially developed in collaboration with sociologist Andrew Barry. The work has changed slightly since the first version, then called Personal Political Indices (Pindices) in the group show Making Things Public curated by Bruno Latour and Peter Weibel, at ZKM Karlsruhe, in 2005. People respond to a prompt or question by taking badges that answer it in some way. For the TEDGlobal conference, there will be new badges with questions relevant to the conversations at TED. 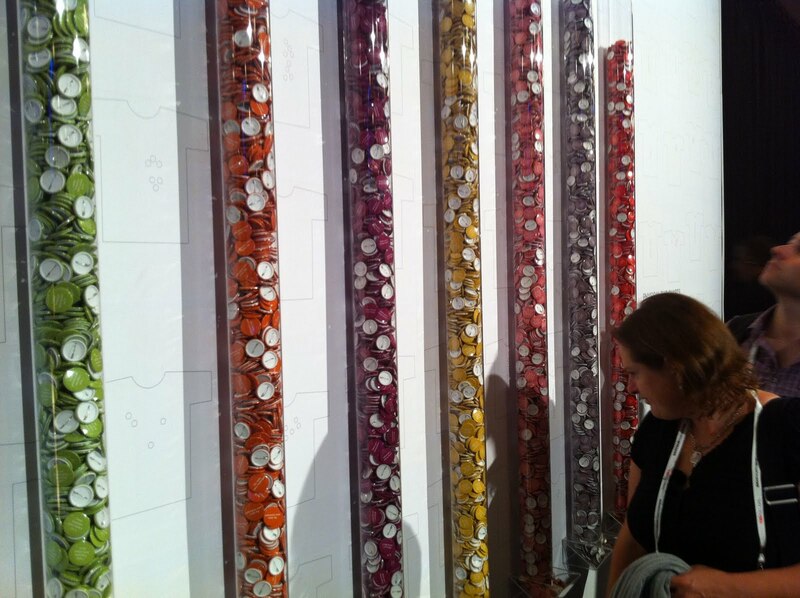 The resulting Physical Bar Chart shows which badges are most popular, and being viewable in a public space within the conference, allow people to have a bigger picture about what the conference is thinking. Meanwhile the badges prompt new discussions as they are worn around the conference and city, or back home. The piece operates on a number of levels. The photo shows a version of Physical Bar Charts, installed at Said Business School, Oxford, in 2008 as part of the Imagining Business conference. 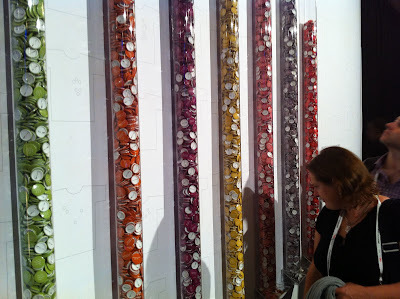 More about the piece: Pindices and Physical Bar Charts. In March I co-facilitated the four-day Design Challenge 2011 for students at Temple University, Philadelphia, with James Moustefellos who with Youngjin Yoo directs the Center for Design + Innovation within the Fox School of Business. 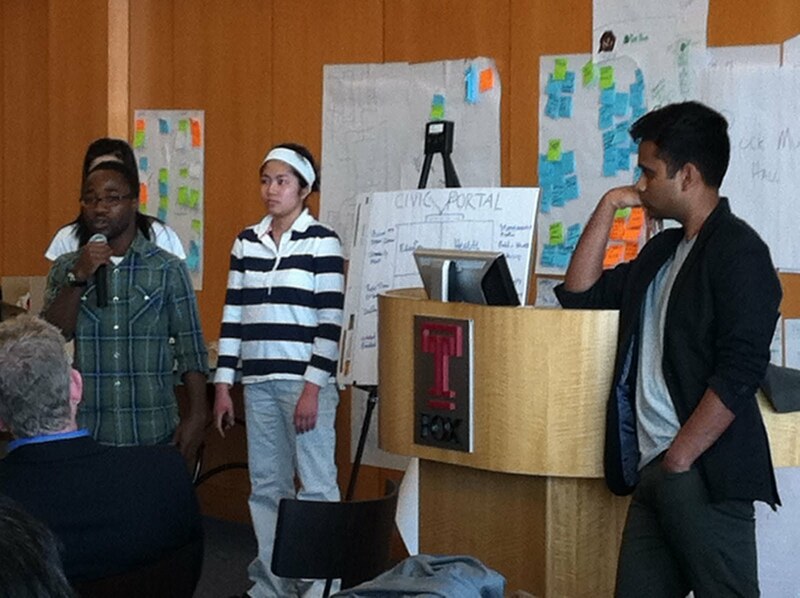 An open call to students across all departments at Temple resulted in around 18 teams signing up for the day. All of them had to be mixed in terms of disciplines, drawing on at least two departments, although the majority of participants came from the Fox Business School. - How can we use increasingly pervasive digital technology to re-imagine the future of the city? - Can we build a sustainable open platform that encourages and supports a vibrant ecosystem of neighbors, entrepreneurs and communities? Over four days, students worked together to do first-hand research in the North Broad area and then come up with service concepts to address issues they identified. This included a detailed briefing with input from community leaders and from city organisations (on Monday) and a one day workshop (on Thursday) led by James and I, which was a day of intense idea generation and visualisation. The presentations at the end of the day, judged by a team of entrepreneurs, community leaders and academics, showed what a wide range of responses. Students presented their insights from their research, and then proposals for a new service journey or service encounter, communicate in a range of media from collage, to sketches, to role play. 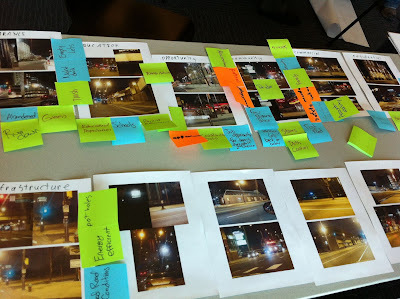 The successful propositions combined an understanding of the service ecology around North Broad St, and a creative reconfiguration of community resources supported by digital technologies. As a learning experience for the students, it showed how design-based approaches support rapid collaboration and proposition development. As a way to build relationships between the university and its community and city, it showed how to engage student energy and entrepreneurial drive. I look forward to next year. This is a guest post by Derek Miller, founder of the Policy Lab and senior fellow at the United Nations Institute for Disarmament Research (UNIDIR). The Policy Lab provides research and design services at the policy, organization, and field-levels to reduce barriers, create conditions, and design solutions for strategic engagement with local communities. It is the successor to the Security Needs Assessment Protocol (SNAP) project of the United Nations Institute for Disarmament Research in Geneva (2006-2010). The SNAP project was an innovation initiative to explore the potential for best process approaches to the design of local action on security matters by UN operational agencies. With Derek and his colleague Lisa Rudnick, and ethnographer Gerry Philipsen of the University of Washington, I co-organised a three-day conference on Strategic Design and Public Policy at Glen Cove, NY, in June 2010, the brought together specialists from design, policy and cultural research to explore the idea of bringing local knowledge to the design of local action in the context of security and disarmament. Thank you for coming today. I hate it when I’m booked into a large room and no one comes. I have to suffer the double indignity of talking to myself and then having my own words echoed back at me. My thanks as well to professor Ulla Johansson, whom I met at a conference in Cleveland on the convergence of design and management. I do want to discuss a topic that I believe is important. It is not a topic I have seen addressed in any great detail or with particular urgency, and yet the topic deserves both. If we to boil it down to just a phrase, I’d say the topic is design ethics, and my particular concern is better ensuring that the ever-closer relations that design is forming with public policy is informed by the necessary seriousness of mind required to achieve some real good in the world. Underlying that aspiration is also a concern. The concern is that failure to do so could mean that we actually cause a harm. As designers look towards ever-new domains for social innovation, especially in public service, it would be wise to ensure that this aspiration towards social betterment is guided by the tutored consideration of our actions and their impact on others. My perspective on design comes from outside the field looking inward. My vantage point for reflecting on design has been Security Needs Assessment Protocol project at the United Nations Institute for Disarmament Research in Geneva. Started in 2006, SNAP was an innovation initiative into the design of community-level peace and security projects and programmes by the United Nations. I designed and ran that programme with Lisa Rudnick. SNAP was supported by the Swedish, Dutch and Norwegian foreign ministries and its purpose was conceptualize, design, and test new ways to A) generate local knowledge at the community level and B) turn it into a strategic asset in the design of local-level interventions. Our work was thematically concerned with community security — that is, attending to matters of violence — though the applicability of our work extends rather farther. Recently, I’m pleased to say, the 22nd Biennial of Industrial Design (BIO 22) being held at the museum of Architecture and Design in Slovenia selected SNAP as one of the “good practice examples” in the field of Service and Information Design to recognize this innovation in bringing social research, design, and international peace and security closer together. I’d like to add that our introduction to the field of design was assisted by our colleagues at Live work in London and Oslo. This wasn’t a client relationship but rather, since 2008, has been an on-going conversation into the relationship between our professional domains. Our conversations with Lucy Kimbell at the Said Business School at Oxford further contributed to our induction into the profession of design. Those conversations continue. The process of bringing together the professional domains of socio-cultural research, design, and international peace and security was a revealing exercise. And today, albeit briefly, I want to share a few things it revealed. The center of gravity for this discussion might be termed “responsible design.” The framework for considering responsible design is the topic of ethics. To discuss this properly, I find it helpful to begin with a distinction. The distinction is between an ethos for doing good, and the ethics of doing good. An ethos is a general orientation, or set of guiding principles. It is like choosing a direction, like facing east rather than west. Many designers today, especially the younger generation of designers, want to do some good in the world. They no longer seem satisfied simply creating objects of desire for profit. This is laudable. But for the good intentions of the design profession to actually result in some good, it is going to be necessary to carefully attend to how we design. Design is both a social process, with implications for others who are participants to that process, and also brings something new into the world that may have social force. Attending to both matters responsibly will be essential as the field moves forward. This is especially true as design steps into the wider world of international peace and security — given that the issue here is not consumer value but life and death. If an ethos is an orientation, then ethics is the set of rules we establish and enact to guide and judge to our actions. There is some limited discussion about ethics in design, but in comparison to codes of conduct in, say, anthropology, architecture, and medicine, one would be forgiven for finding them undeveloped. Design ethics appears to be under-theorized, and under- codified given that design research is now crossing the borderline into social research, including ethnography, which involves research with or on human beings. It is worth recalling, for example, that since 1947 and the establishment of the Nuremberg Code, the voluntary consent of people to research has been treated as “absolutely essential” by many organizations. Though written in direct response to medical experimentation, design research is now stepping into a world, as mentioned, where the process of learning, and the outcomes of learning both have social implications. It is time to turn an eye towards the ethics of design research. Perhaps even more importantly, design is also stepping into the area of social action, through such activities as social innovation, whereby the outcome of a design is a social change in the world. This invites a rather obvious question. What, exactly, is guiding your conduct? It is a profit motive that allows the market to regulate value? Or will you uncritically adopt the mandates and missions of the organizations that hire you? Will you trust your own inner voice to lead to you to proper conduct, or will you endeavor to determine what common ethical grounds can be created for cooperation? How will you do that? We are not going to solve this today. But we can take some preliminary steps to map out the terrain that we are going to face. That terrain is conceptual. It is a place of ideas, and the relations between ideas that in turn guide our actions. Clarity is helpful in that regard. So let’s first try, for just a moment, to conceptualize and situate design in continuum between knowledge and action. Close your eyes for a moment. Try to remember the world before Powerpoint. Imagine two circles beside one another. They do not touch. The circle on the left will be labeled knowledge. The circle on the right will be labeled action. What is the relationship to be between knowledge and action? And where does design fit in that relationship both conceptually and procedurally? In my field, of international peace and security, we can actually see the institutionalized distinction between knowledge and action. The university system and think tanks, policy centers, and research NGOs constitute the “knowledge sector.” They get money from governments to go generate knowledge and then bring that knowledge across the street to the decisionmakers in the operational agencies as well as to the politicians. These latter people are the decision makers. They are the consumers of knowledge. (If we’re lucky). This is not ideal, but it is real. Notice how something interesting has happened here. One of the inadvertent functions of democracy is to keep knowledge distinct from action. Action is to be a product of democratic choice, and bureaucratic implementation, not professional knowledge. That is, action comes from decisionmaking, and decisionmaking is a political process, subject to political correction. You don’t like the decision, you throw out the decisionmaker and elect another one. Design exists only in debate. Not as a process for moving knowledge to action. What is absolutely crucial to understand here is that the legitimacy of actions by decisionmakers — whether they are policymakers or civil servants — is derived from the political philosophy of democracy itself. Liberalism. The social contract. Self-government. We the people. That sort of thing. That is why it’s OK for them to do things to you. Raise your taxes. Tear up your roads. Go to war on your behalf. Change your health system. Legitimacy, in political processes, is presumed by the system. Is not a product of the system. Here’s what’s good about the democratic model: It allows for, and creates, systems and processes to try and ensure that the will of the people is expressed in the action of decisionmakers — whether at the highest or lowest levels. Said differently, social action is meant to be derived from democratic processes. Insofar as democracy is good, social action will be legitimately enacted. Here’s what’s bad about it: There’s no mechanism for good designs to be introduced into the system, because no one is really wondering what to do. When answers are dictated by political processes, people don’t entertain a lot of questions. Instead, they are given platforms, mandates or missions to fulfill. Because that’s what people want. The knowledge-to-action nexus simply does not create space for design process. So is that end of the story? 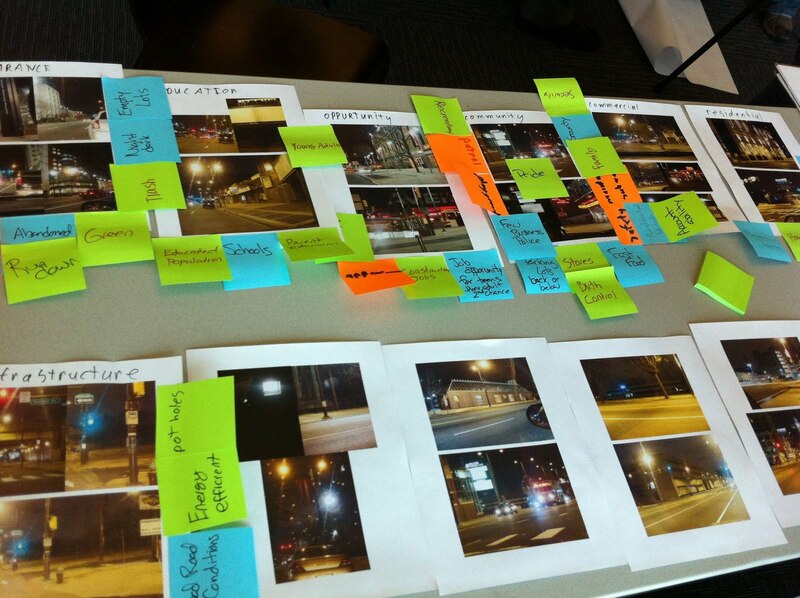 If there’s no design space in public policy, isn’t that the end of the road for design? Actually, no. I think it’s just the beginning. And here’s why. The times are changing. Deep in the bowels of democratic nations, the very definition of legitimacy is starting to evolve. People don’t just want a voice anymore. They don’t just want to elect people who will advance their will. They are starting to demand results. If at one time governments simply had to make hard decisions about peace and war, the economy, and other matters, today, the systems into which they are making decisions is so complex, so non-linear and dynamic, that sheer force of will and character is no longer enough. Climate change, global terrorism, the depletion of fossil fuels and the energy crisis, the shortage of clean water, the threat to the nation-state system in most of Africa and the Middle East, the breakdown of almost every social service including transportation, health, and education... these aren’t decisionmaking issues. They can’t be solved by leadership alone. These are design issues. They require tutored and fastidious attention to the process of both generating knowledge, and moving it to action through processes of design. I think the door is opening for design if we conceptualize design as a process for moving knowledge to action in innovative, rigorous and ethical ways. Design is the application solution for knowledge. If we see little space for design in public policy due to certain philosophical premises in democracy — which become manifest as routines in bureaucracies — we do see comparably more space for design between knowledge and action in industry, where results somehow depend on the design of solutions to problems. Here, legitimacy isn’t presumed. It’s earned. It is no wonder, then, that designers and business leaders are thinking that design can now be applied to public policy. After all, if people want results, and we design results, it should be a pretty smooth transference of skill sets. And so, with energy and a whole lot of money, design is stepping into the unknown and promising that it can lead. And yet, for those of us who are serious researchers and are serious public policy people, one can’t help but sense a certain loose relationship between design today and the simple notion of rigor. As design moves away — or at least broaden from — its creation of objects of desire to social processes and systems, it is reaching a point of creative tension with its own premises. These premises are challenged as it steps into new domains, and also as it steps into new cultural systems. Premises about value. About utility. About rationality. About social relations. Even about the very nature and use of time. This is a wonderful moment because design now has a chance to step through the open door being offered by the re-imaging of public services and government. It is a formative period too, because the directions you set out on will have profound implications down the road as the paths further diverge. Get it right, and design will take it’s place between the philosopher and the king at the high tables of social influence. Get it wrong, get distracted, go the easy route, and design will be a trendy, marginal field that could never gets act together. My concern right now — as I advocate for design in public policy — is that the field is adopting some rather under-developed theory at what seems to be alarming rate, at a very formative moment. In the rush to be useful, to be seductive, to be creative, to be responsive, the professional field of design might be taking shortcuts that will lead it quickly to irrelevance. There could be a “design bubble” developing and it could pop. One way to avoid this is to not mistake the panic of industry to find new ideas with the quality of ideas its finding. Panic buying tends to push the price of ideas, and therefore the investment in them, down. In a panic, any old idea will do. However. If the goal here is really to achieve some social good in the public service, lead design into a more socially influential future for the greater good, and actually mainstream design at the nexus between knowledge and action, then we might just need to slow down, and grow up. Those are two odd requests for design because, historically, it hasn’t needed to. But as design looks towards public service, and as business looks towards emerging markets, fragile states and conflict zones, business as usual is going to get people killed. That’s not a mere turn of phrase. Here are the topics I deal with at UNIDIR, in no particular order. Small arms and light weapons, landmines, conflict prevention, crisis management, post-conflict reconstruction, peacebuilding, weapons collection, disarmament, demobilization and reintegration of ex-combatants, crimes against humanity, child trafficking, gender-based violence, conflict analysis, conflict sensitive operational programming, and that’s just the small stuff. Add biological, chemical and nuclear weapons, weaponization of space, terrorism and counter-terrorism, state fragility and just basically war, and we’re starting to fill out the topics that come up on Monday mornings at 11 at UNIDIR’s staff meetings. These are real, grown up issues that need real, grown up attention by people who are committed — professionally – to trying to figure out what is wrong with their own ideas, and not what is right about them. Designers are worryingly not involved in that process. Design is trying to prove itself, rather than disprove itself. It is the latter, though, that will serve the social good. Allow me to explain. What my don at Oxford meant by his quip was that every idea seems like a good idea until you learn what’s wrong with it. And generally speaking, you learn what’s wrong with it by trying to. There is a very strong school of thought in science, and I count myself in this camp, that believes we cannot truly prove things. What we can do, however, is disprove things. We try to figure out, not what’s right about a given course of action, but what’s wrong with it. If you turn it over and over and over again in your mind and can’t think of anything, you give it a go. We haven’t proved it’s a good idea. But we’ve hopefully weeded out the worse ideas and in doing so raised our confidence in the course of action we’ve chosen. Karl Popper is a key reference here. Today, design does not seem to be centrally concerned with building theory or processes that can be disproved. In fact, it doesn’t seem to be interested in process at all. It seems to be interested in thought. And yet, thinking and acting are not the same. If one can engage in “design thinking” then it stands to reason that one can have “design thoughts.” But ... now what? The problem with so-called design thinking is that it is about just that ... thinking. Mapping out — or just speaking metaphorically — about ways of thinking is not the same as producing systems, processes or frameworks for mobilizing thought to action. Design thinking — though a catchy slogan to be sure — is not a developed analytical concept, is not distingusiable as a means of thoughts from other forms of thought, and let me go on record saying it is not a “methodology.” In the words of Gertrude Stein, there’s no there there. If it cann’t be distingusihed, defined, enacted, or falisfied, I’m not sure what it can do other can sparkle and hypnotize. For “design thinking” to be worthy of serious consideration, rather than just rhetorical appropriation, it will need to evolve into an actual analytical framework that tells me something about the world, and in turn allows me to differentiate it, genuinely, from other forms of thinking. Right now, it doesn’t. In a nice blog entry at the Harvard Business Review, Peter Merholz (9 October, 2009) shared a smiliar lament. He wrote, “We have librarians, and historians and fine artists. All of these disciplinary backgrounds allow people to bring distinct perspectives to our work [in business], allowing for insights that wouldn’t be achieved if we were all cut from the same cloth. Do we need to espouse ‘library thinking,; “history thinking,’ and ‘arts thinking.’” Merholz was right to call this absurd and to point out that design thinking is merely clever repackaging of some social science — but sadly, not good social science. The reason this troubles me, rather than just distracts me, is that “design thinking” is directing creative attention away from the pursuit of intellectual clarity, and the progression of design as a serious endeavor. And part of that failure is ours. Ours as a design community. And at this point, for this reason, I will include myself among this world of designers. Our collective failure to demand clarity from ideas — especially when our ideas lead to actions of moral consequence — is an expression of moral weakness. It takes courage to demand clarity. To stand in front of the masses and say, “I don’t understand. You are going to need to explain that again.” And an idea continues to make no sense, we must entertain the notion that the fault is not ours. Some things in the world are wrong. And it requires courage to say so. I would like to see a new contract formed between design and public policy. But only if that contract is well written. I want to end this presentation by briefly mentioning what we’ve done to establish a new agenda and programme of work for design and public policy. In June of this year, the SNAP project at UNIDIR, in cooperation with the Said Business School at Oxford, and the Center for Local Strategies Research at the University of Washington, hosted an agenda-setting event called Strategic Design and Public Policy. It included top thinkers and practitioners in cultural research, design, and international peace and security. It put together a real and serious agenda. It is not as shiny as some of the other things on offer today. But I assure you, isn’t dull either. In considering those three circles again, it is now clear – following that event – that there are serious issues between and among all three of these thematic areas that are going to need attention if a new model for legitimate and socially beneficial design is to be developed. We need to step away from metaphor and mystical thinking, and get serious about strategic design. The Strategic Design and Public Policy agenda, created at Glen Cove in New York, explicitly notes the theoretical, methodological and practical gaps between the generation of knowledge and its application to design processes, on the one hand, and the integration of design processes and products into public policy on the other. We view these as matters for attention, and challenges, not obstacles. In the discussion that drew the event to a close, participants from cultural research, design (especially service design) and public policy suggested next steps as an agenda for strategic design and public policy. These steps are already being implemented in at least half a dozen organizations including UNIDIR at the UN, the University of Washington, and live|work, among others. It is a detailed agenda, but there are four categories for action. 4. Pursuing solutions for social betterment through social action. This cooperative agenda opens possibilities for research, design, and public policy to start working in closer synergy in a rigorous, ethical and systematic manner to build the foundations we all need to take more confident action for the public good. And I hope you’ll join us. I’m delighted to speak here at Götenberg on this topic, and my hope is that is the beginning of a conversation and not the end. This is a short summary of the MakingCraftingDesigning symposium held in February at the wonderfully-named Akademie Schloss Solitude, near Stuttgart, organised by Sarah Owens (Zurich University of the Arts) and Björn Franke (Royal College of Art, London). Attended by around 100 people, mostly from design schools in Europe with a sprinkling of others, the event was particularly enjoyable in the way it ranged from discussions of design thinking and practice to questions of new sites for human activity in creating the artificial such as bio- and nanotech. By drawing such a huge canvas, I think the organisers succeeding in raising some big questions about whether the term design is useful to cover both the former and the latter. As usual please be aware I may have misunderstood the speakers and any mistakes in presenting their ideas are mine. Richard Sennett (New York University/London School of Economics) is a well-known sociologist, recently fashionable among designers because of his book The Craftsman, which asserted the importance of material skills and practices within a range of contemporary contexts, not just those we call 'craft' industries. Sennett gave his keynote on the first night, giving some insight into his next book which he had just finished. The basic idea seemed to be about the difficulty and critical importance of co-operation in the contemporary world especially getting along with and working with those we don't like or understand. Sennett made a distinction between the dialectical and dialogical underpinnings of cooperation and also between sympathy and empathy. Acknowledging difference was an important part of this thinking. The rest of the symposium took place the following day. Sarah Owens and Bjorn Franke gave an introduction explaining a series of distinctions they wanted to make between making, bricolage, crafting and design, the latter seen as detached from specific design disciplines, with a higher level of abstraction than the other three terms, and a greater level of planning and awareness of the possibilities and consequences of productive action. Next up was activist (in Reclaim the Streets) and cultural theorist Stephen Duncombe (New York University). His talk "The Art of the Impossible: The Politics of Designing Utopia" reminded us of one important aspect of design and art practices - creating artefacts that fire the imagination. He talked about how Thomas More's Utopia was both satirical and sincere. The point, he said, was that if a designer or writer leads you into an imaginary world, you begin to question what is normal or absurd. The self-conscious absurdity built into More's Utopia is a prompt for the reader - what is proposed is so ridiculous that it has to be modified, and this is the starting point. Contemporary examples he gave of people doing this included Julian Bleecker, and the Yes Men. "These impossible dreams open up new realities..they ask what if, without seriously saying, this is what...They are models that stimulate invention...left out for all of us to imagine with..."
Next was my talk, Designing Future Practices, which I will publish below. This paper speculated that what designers are designing is future practices. Susanne Küchler (University College London) is an anthropologist whose background includes extensive fieldwork in Papua New Guinea and Polynesia but who has been studying contemporary design more recently. Kuchler reminded us that in ethnography, researchers repeatedly ask "What difference does something make?" She emphasized the long-standing preoccupation with material artefacts that is part of anthropology which has revealed something about how designs shape cultures. But now, she said, maybe it is the end of any idea of there being a unified idea of design because of the advent of new materials. She described the recent development of materials libraries and where these come from and what they are doing. There are new materials that have been designed and developed way before a product design or architecture project might happen. Materials scientists and engineers are involved in inscribing properties into new materials that in a way makes design proceed in a particular direction - design before design(ers). She asked what kinds of thinking and making environments do we need in the 21st century to liberate ourselves from the stranglehold of existing disciplines? 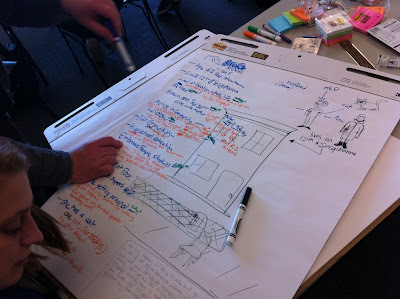 And how can we develop a language to engage with scientists who are designing things that design? Since I mostly notice the intersection of design and anthropology focussed on designing new things/services/organisations, it was fascinating to hear an anthropological discussion about design that focussed on the thingness of materials before designers get their hands on them. Alas at this point, the adrenaline had worn off and I was less focussed on the presentations by the next speakers, to whom I apologise. One was by philosopher of science Alfred Nordmann (Technische Universität Darmstad). He described how technoscience is trying to do things that exceed the imagination but result in the creation of mundane things in the world that evade rational control. His concern seemed to be challenging to the idea that technoscience can steer human nature in planned and predictable ways, something that I would hope designerly designers would be modest about. Finally, Oliver Müller (University of Freiburg) used the idea of Homo Faber to reflect on the implications of biotechnologies that support to enhance humans. By interfering directly with our biological selves, he suggested, we are the craftsman, tool, and product all at the same time. The question I want to pose today is, what is it that designers are designing when they do design? We think we know the answer to this because it’s clear that many designers design things: stuff. The tangible and digital objects that are part of day-to-day life. But in the past decade something has been happening in professional design practice, and in other fields that traditionally we didn’t think of as design, that makes it important to revisit this question. There are design agencies that say they help tackle big social challenges. There are design entrepreneurs who set up new ways for public services such as the police to engage with the public. There are consultancies using design-led approaches to design new social ventures to reduce dependence on the state. There are multi-disciplinary teams who say they use a design process to re-think environments, products, experiences, and curricula for schools. There are people working in international security who want to work with professional designers to redesign disarmament programmes within the UN context using local knowledge to design local action. And of course there are conferences and workshops at which people come together to try to make sense of all of this. First let’s review some of the different ways of thinking about what designers design. 1. The first is the artefact-centred approach. This is embedded in the ways that most Western design education is currently taught, as you can see from this slide from a well-known art and design school. This institution offers post-graduate courses based on different kinds of designed thing, from communications to textiles to products. Although there are projects and indeed courses that challenge this convention, with moves to “post-disciplinary design” or to a generalised “design thinking”, the artefact-centred categorization is broadly true. To be more accurate, the focus of design is not just an object, but the object and a user’s engagement with it. An echo of this object-based division of design is the idea of there being “four orders” of design which are signs, things, interactions and action (Buchanan 1992; 2001). However there are a number of problems with this approach. The most important is that a focus on specific types of thing, such as a toothbrush, can miss the situated nature of our engagements with designed things in relation to many other things in our social worlds. Taking one type of artefact and idealised user in isolation from the practices and contexts that link it to many others, amputates many of the important sets of relations that make things meaningful and purposeful. 2. A second way of thinking about what designers design is to say they design systems. This has been developed by scholars and practitioners influenced by anthropology and sociology over the past two decades. Key names here are Pelle Ehn, Winograd and Flores, and Lucy Suchman, and others working in the communities known as participatory design and Computer Supported Cooperative Work (CSCW), working mostly on the design of computer-based systems. Their insights came from studying not just artefacts – although those are important – but what people do with them, in spite of them, around them and in relation to them. The focus on users’ work practices shifted attention away from artefacts to the idea of designing systems that are both social and technical. An important idea here was that agency was distributed – it wasn’t just the user that mattered (privileged by a humanistic or rational approach), or the artefact (as hoped for by some designers), but rather the integration of people and things in places in relation to many of other socio-material arrangements that constitutes the world of design. I cannot hope to summarise this huge body of work. But I will refer to a paper from 2008 by Pelle Ehn, in which he does so, and directly addresses the evolving object of design. Using Wittgenstein’s language games, Ehn talks about design games and focuses on two kinds of game. The first design game is what happens in design projects, when the focus is design-for-use before use. The tradition of Participatory Design with which he was very involved in developing has a strong focus on designing with people and understanding their uses of things. 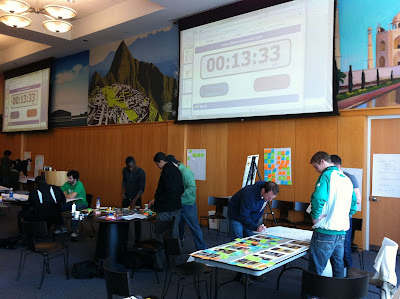 The second design game takes place after a design project, at what Ehn calls “use-time”, when the designers are finished with their work, and are possibly even dead, but still people are using their designs. Thinking ahead to use-time, the object of design is then to create design games which users will engage with in their own ways, understanding that this can never be final or complete. Although this is useful, there are still questions to explore. One is how to conceptualize in more detail design-after-design: what happens when users engage with designs and infrastructures after project time, at use time; and what happens when they engage with artefacts in quite different contexts to the ones the designer imagined and designed for. A first question is working out an analytical category that helps us think about what that future use is. Can we talk about designing design games when the actors are extremely dispersed in time and space? A second question is, how do some kinds of usage stablise and become routine? A third is, how do different timeframes affect the idea of designers designing design games for design by others after design? 3. In search of ways of understanding this better, I have been drawn to work by scholars in the social sciences who offer another way of thinking about the social world in which designers design, specifically theories of practice. Key writers here are Theodore Schatzki and Elizabeth Shove, drawing on earlier work by thinkers such as Bourdieu, Foucault, Giddens and also Heidegger. Now, Ehn’s work is centrally concerned with use as practice, based on the idea that it is through our practices that we construct reality. Further, he says “As designers we are involved in reforming practice” (Ehn, 1988: 147). But he stops short of saying this is what designers design. In what follows I will aim to show why thinking about designing future practices offers something useful to theories of design, and suggest what the consequences might be. The proposition I want to explore is that what designers are designing is future practices. I want to see what the opportunities might be of thinking of design in this way. There is not time to go into practice theory in detail. One important idea is that practices are made up of several elements, which cannot be taken in isolation. Andreas Reckwitz (2002) describes practices as “a routinized type of behaviour which consists of several elements, interconnected to one another: forms of bodily activities, forms of mental activities, ‘things’ and their use, a background knowledge in the form of understanding, know-how, states of emotion and motivational knowledge” (Reckwitz 2002: 249). A second idea is that practices are dynamic – they can change over time as different elements change. A third is a focus on routines – the repeated, mundane activities that constitute the social world. As Elizabeth Shove has pointed out in her work on the environmental impact of everyday practices of consumption, new designs for power showers lead to much higher individual water consumption at a time when authorities in many countries want us to conserve water. But instead of looking at bits of what goes on in showering in isolation, Shove argues that we understand how the contemporary practice of showering has come to be – combining both materials, stories and images, and knowledge and skills. Trying to change one of these, without attending to the other entwined elements of the practice, is, she argues, unlikely to be successful. The idea of practices, therefore, presents a way of ordering what happens in the future in relation to designed artefacts. It shifts attention away from infrastructures or design games that some designers had a hand in designing. In the future, at use time, there are people and their bodies and minds engaging with stuff within particular sets of relations, which constitute particular meanings. Design is always unfinished because practices mobilize artefacts and people and bring them into new kinds of relation with one another. Most designers don’t think about their work in this way, although there are inklings of it. The consultancy IDEO, for example, talks in terms of cell-phoning, rather than cell-phones. But in general the default concepts in contemporary design practice are things, users, and contexts, but not social structures and ordering. I want to offer up an artefact from professional design practice, which is heading in this direction, specifically the customer journey map created by designers of services. Service designers see their work as concerned with designing all the tangible and intangible elements of a service, both the digital and material touchpoints and scripts within the service encounter. Although service designers do not talk in terms of designing practices, all the elements I outlined earlier are there in the customer journey map – there are people, minds, knowledge, stories, artefacts, structure and agency. The customer journey map is not the only artefact that is required to do this design work, but it is one that tries to articulate the multiple dimensions of using a designed thing in practice, and understanding these routines to be situated, embodied and relational. I think this view of what designers design is relevant not just to designers of services but to designers of products, communications, buildings and also policies and strategies. It does not diminish the need to pay attention to artefacts – far from it – but it understands the meaning, value and effects of artefacts to be constituted in practice in relation to bodies, minds, stories and knowledge. I said earlier that Ehn’s work was based on the idea of practice but that he drew back from stating that designers design practices. For Ehn, what designers design are cultural-material design games (1988; 2008). The context of his early work was a Scandinavian approach to system design that found ways to involve workers in the design process for political reasons. This involved doing system design differently to serve the users – to make the resulting computer artefacts work better in relation to people’s work practices ie to design new computer artefacts that fit with practices, and sometimes creating new ones. In contrast, Tony Fry (2007; 2009) has argued designers should design new practices to change habitus, to use Bourdieu’s term. Fry’s concern is how design is implicated in making an unsustainable world. Designers need to understand the effects of their stuff on the world and their role in reproducing a way of living which is not sustainable, and to change it into one that is. His response is to propose a “redirective practice” with the ambition of designing another habitus, so that as humans we have a different way of being-in-the-world. So here is an interesting dilemma – whether to design future practices that are based on how people are now, as Ehn argues, or whether to design future practices that change how people are in the future, as Fry suggests. The former comes out of a Scandinavian commitment to a particular kind of democratic participation; the latter emerges from a deep concern with whether there will be a future in the future. Both are political but have a quite different set of implications. Clearly there is no right answer to this, but even framing the question highlights the importance of design’s role in world-making. Briefly, I finish with some suggestions about how this approach might change how designers practice and how they are educated. Although some designers have been moving towards a kind of dematerialized design thinking or to trans-disciplinary design, away from objects, people still need to design stuff. So my proposal is, that designers design stuff but understand the objects they make to be part of existing practices or involved in creating new routines in the future that are unfinished, contingent and, importantly, to some extent unknowable. 1. It draws our attention to how new designs can create new meanings, knowledge and skills, and potentially new ways of being in the world. 2. It highlights the unintended consequences of designs, which cannot always be known in advance, yet for which designers might consider themselves accountable. 3. It emphasizes the dispersed agency of the various actors that constitute future designs: and makes the designed stuff always in relation to other stuff and people. 4. It raises questions about the time-frames over which designers’ work has effects. How to bring these ideas into teaching and learning? I speak as someone who for over five years has been teaching exactly this approach to MBA students taking my elective in design. As managers and entrepreneurs, these students are already doing a kind of design activity although they rarely think of it like that. They design products, services, projects, ventures and organizations which create new kinds of practice involving both bodies, minds, things, agency and so on, disrupting existing practices and seeking to modify or replace them with a new kind. 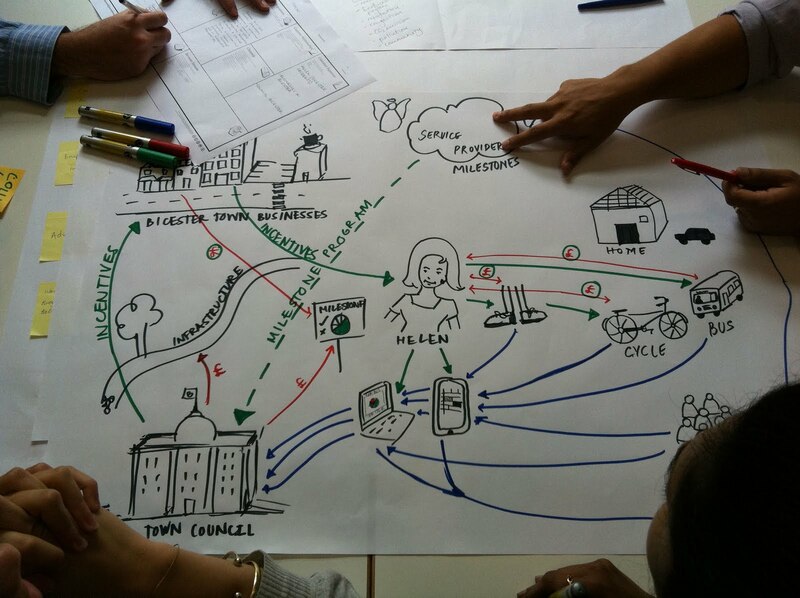 (c) Give them opportunities to use designerly methods such as mapping the service journey or visualizing the service ecology. Whether this approach is taught to MBAs or to more conventional design students, one important question is then what kinds of knowledge are required. I would say a passing knowledge of sociology and anthropology is essential now that design has realised it is profoundly social. But if you trawl the websites of design schools, the Venn diagram you usually see shows intersecting circles labelled “design”, “business” and “technology”. Ignoring the social worlds in which designed artefacts acquire their value and meaning is a weakness in much current design education. To conclude, I have argued that although we still fall back on the idea that designers design stuff, it’s more than time to bring in work from Participatory Design, CSCW and other design-based fields that have drawn extensively on anthropology and social studies of science. The contributions here have included attending to users’ work practices; to see agency as distributed; and to be concerned with thinking about design-after-design at use time. I then explored work from theories of practice that offer a slightly different way of thinking about the things that designers design emphasizing routinised ways of doing things – the habits that we take up and the habits that take us up. I believe this is a resource for designers – whose stuff already has unintended consequences. Thinking in terms of future practices offers one way of bringing these more directly into view. However whether designers want to change practices to serve people better, or change practices to change people, is a question that designers must answer for themselves. Thanks to Simon Blyth and Cameron Tonkinwise for their feedback on earlier drafts. Note: This essay is likely to be revised considerably for the proposed book which comes out of this conference. Comments welcome.